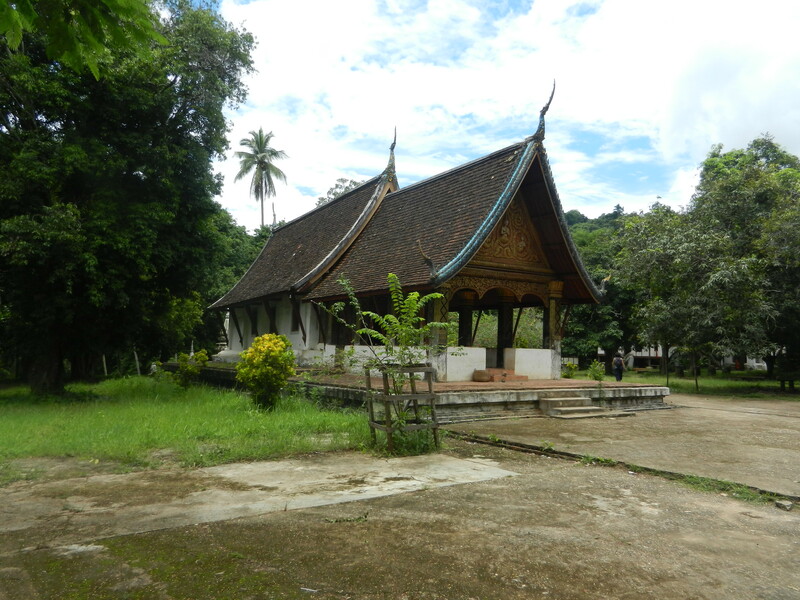 Many fans of Laotian art say that Luang Prabang’s Wat Xieng Thong is the most beautiful temple in the country. It was built by King Setthathirat in 1559. He ruled the Lan Xang kingdom, and he strengthened Buddhist practices and linked them with his court’s image. Many Southeast Asian monarchs fused religious and royal institutions in the 16th century to consolidate their holdings. But Setthathirat knew that his people’s folklore was so rich that he had to compromise with it, rather than try to wipe it out. 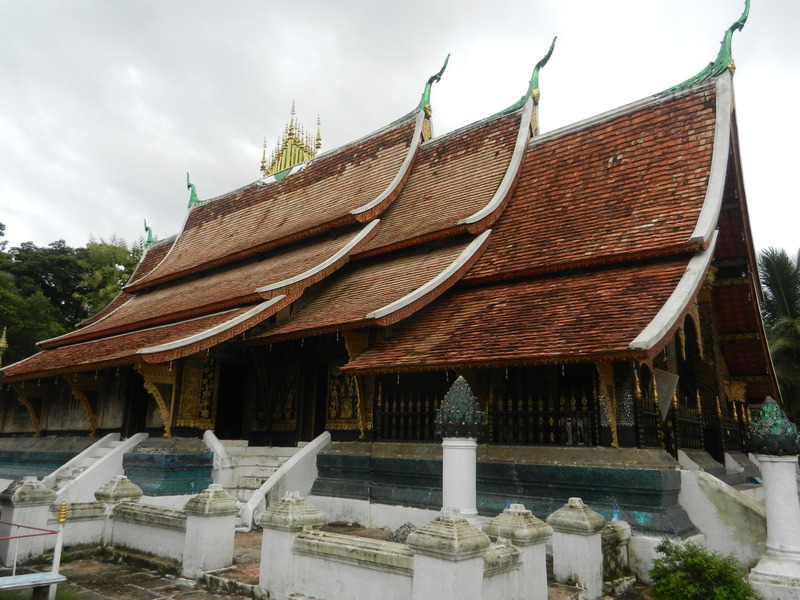 Behind Wat Xieng Thong’s beautiful forms were centuries of popular beliefs which preceded Buddhism. Both blended in some very cool ways. Wat Xieng Thong perches on a little hill by the Mekong. Here’s the view from the road by Wat Xieng Thong. The royal palace also presides next to the Mekong. Setthathirat’s most prestigious landmarks were thus embedded in the natural surroundings, where lore about nagas (serpents) had long been strong. Naga lore literally shaped people’s ideas of their world. 1. Mayoury and Pheuiphanh Ngaosrivathana, in The Enduring Sacred Landscape of the Naga, wrote that people saw Luang Prabang as a naga’s body. 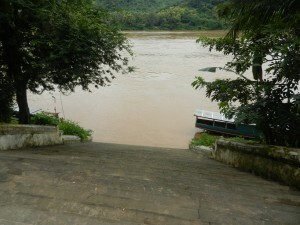 Its head is where the Nam Khan river (above) flows into the Mekong. Its belly is the most auspicious place to trade. Some folks believed that those living at the head and tail can never be as wealthy as people in the belly. 2. 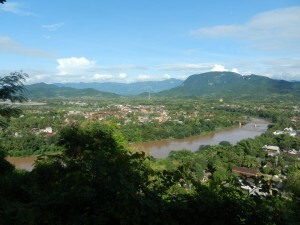 Fifteen serpents protect Luang Prabang, and each is associated with a certain region. 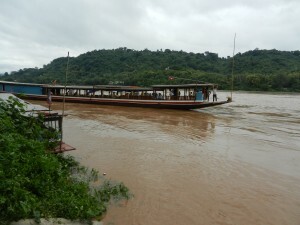 Wat Long Khoun (above) presides by a landing on the Mekong where one of the serpents is centered. People believed that kings needed to organize boat races to honor the nagas if they wanted them to be benevolent. The nagas got their respect, and the people of Lan Xang had fun watching the sport. And priests conducted colorful rituals. Many religious ceremonies started with invocations to both gods and nagas. So the physical landscape, the royal court and Buddhist rituals meshed with ancient folklore about serpents. Thought in Luang Prabang blended all of these in a vibrant way of seeing the world that was usually tolerant, beautiful and fun. But two traumas bracketed the 19th century, and people lost faith in the serpents’ protection. Thailand’s new Chakri dynasty annexed much of Laos, and Thai armies plundered the land in the 1820’s. They sacked Vientaine so savagely that it was abandoned. 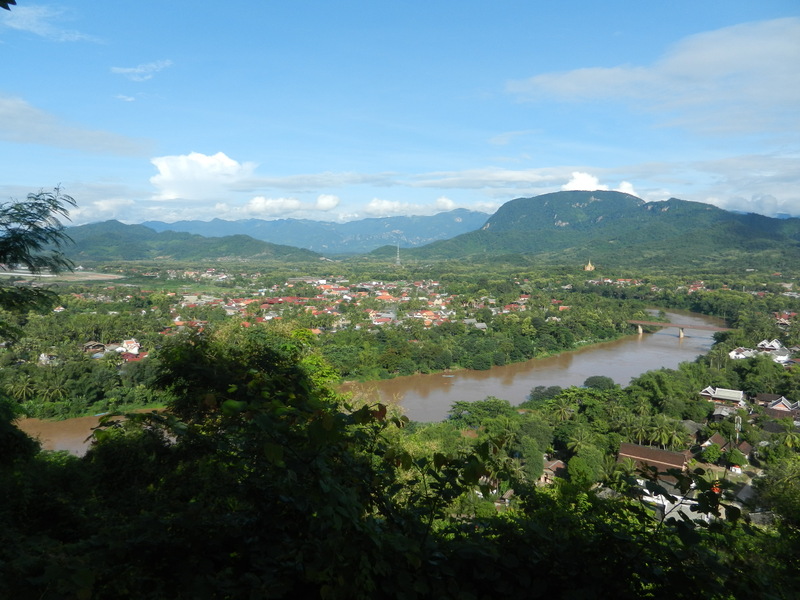 In the 1880’s, bands of thugs from Yunnan sacked Luang Prabang. Many ritual performers were slain, and 14 royal rites vanished. But the next post will show that Laotian folk cultures are very rich and that they responded to this crisis with more creativity. You can’t keep the nagas down for long.